2 Bedroom Terraced House For Sale in Worcester for Offers in excess of £150,000. This two bedroom mid terrace property is located in St Peters and has a single garage and driveway for three cars. 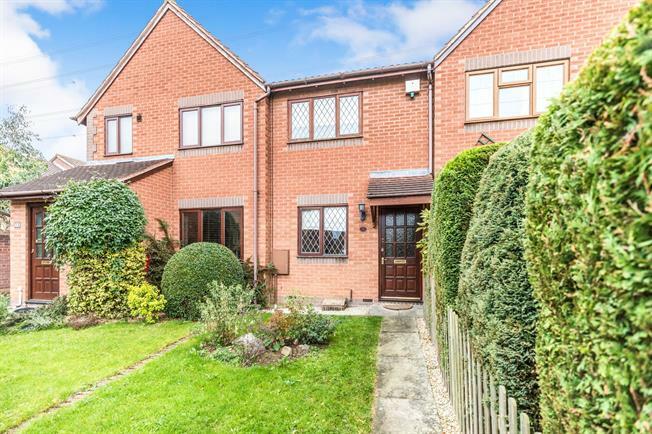 The property is located within a short distance of junction 7 of the M5 and on bus route into the City. The accommodation comprises of an entrance hall which gives access through to the lounge. The lounge has a feature fireplace and door through to the kitchen. The kitchen has an integrated oven and hob and space for table and chairs and door onto the garden. To the first floor are two bedrooms and the bathroom. Both bedrooms have fitted wardrobes. There is a landscaped rear garden which is mainly laid to lawn. There is a single garage and driveway providing parking for two vehicles. The property is accessed via a part glazed door which leads into the hallway. The hallway has stairs leading to the first floor and door through to the lounge. 16'08 x 8'10 plus 6'0 x 2'06. Double glazed window to the front aspect, radiator, picture rail, dado rail, feature fireplace with electric fire inset and mantle over and door through to the kitchen. Double glazed window to the rear aspect, range of base and wall mounted units with work surface over, integrated oven and hob with extractor hood over, space for fridge, space for freezer, wall mounted boiler, radiator and door onto the garden. Access to the loft, doors leading through to bedrooms one, two and the bathroom. Opaque double glazed window to the rear aspect, low level WC, panelled bath with shower over and tiled splash backs behind, pedestal wash hand basin with tiled splash backs and heated towel rail. 11'08 x 8'10 plus 5'02 x 0'11. Double glazed window to the front aspect, radiator and fitted wardrobe providing shelving and hanging space. Double glazed window to the rear aspect, two fitted cupboard providing shelving and hanging space and radiator. There is a single garage to the end of the row of properties. The garage has an up and over door. There is a driveway in front of the garage providing parking for two vehicles. The rear garden can be accessed via the door from the kitchen diner. There is a gravelled area across the rear of the property. Beyond this is a lawned garden with mature shrub borders to the side and a decked pathway to the side which leads to the end of the garden. The garden is enclosed by panelled fencing and there is gated access to the rear and a shed. There is a pathway leading to the front door with a lawned garden to the side.